Vermont is one of the best autumn destinations in North America and these are the best places to visit in Vermont in fall. Every bit of the state transforms into a magical wonderland of reds and russets and bright oranges at the turn of the season, creating the image of an ideal and perfect autumn. There is not a single spot in Vermont that looks less than stunning in the fall. That is why most leaf peepers come by the state by late September to mid-October for fall foliage drives. But there’s certainly more to Vermont than just driving by to see its changing colors. And quite frankly, that does not give you the best of what the state can offer in this surreal time of the year. Fall in Vermont is meant to be experienced and lived! 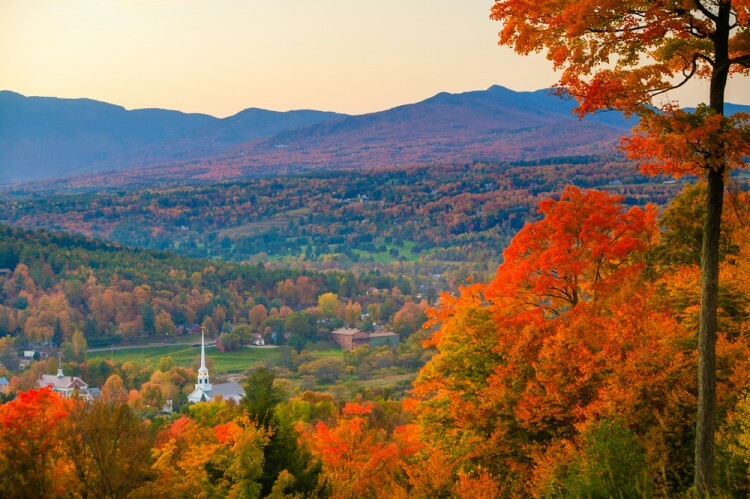 On this list, we have taken the recommendations from popular travel websites like TripAdvisor, Lonely Planet, About Travel, as well as Fodor’s Travel to find the best places to visit in Vermont in fall. Because we believe that there’s more to Vermont than meets the eye, we have ranked these popular destinations not just according to the autumn scenery and foliage they offer; we have ranked these places according to the number and kind of activities they offer the guests. We gave big points for places that offer outdoor activities because after all, that’s the best way to enjoy Vermont: outdoors.But, if you are more of a traveler who likes to visit some cultural sites then don’t miss our article about Historical places to visit on the East Coast, too. Now, let’s head on to best places to visit in Vermont in fall.